The second European single (first single in the UK) from the album "Lifelines" was the title track. It was released in the UK and Germany on 8th July 2002 and in Norway on 15th July. Two CDs were released in Germany. The cover of the single features a green-tone close up shot of the archways found on the front cover of the album, but taken from underneath. Below the arches are some steps with two stools on the top step. 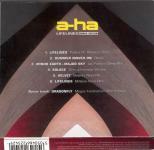 The a-ha logo in yellow is in the top right hand corner of the sleeve with the title in white underneath. 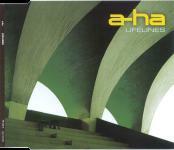 The reverse of the sleeve features a different shot of the arches with the a-ha logo in yellow at the top and track information underneath. The spine is green with white text. The disc is white with a green and white emblem of a flower with the title printed in white. The UK release comes in a regular CD-single jewel-case. It features the "Radio Edit" of Lifelines (3:59), live versions of Hunting High And Low (7:07) and Manhattan Skyline (6:14) (as found on the European release of Forever Not Yours) plus the enhanced video of Lifelines. 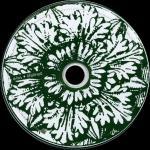 The disc is white with a green and white emblem of a flower, similar to that found on the album disc. The catalogue number printed on the disc is WEA351 CDX, but it is printed as WEA353 CDX on the spine! On the spine the title is printed incorrectly as "Lifelines - Remixes" (even though the disc does not include any remixes) and the video length is listed as 0:01! There wasn't a cassette single release on this occasion. There were two different singles released in Germany. The first has a similar cover and disc to the UK release, but comes in an album style case with an insert which opens out. The disc features four different mixes of "Lifelines". 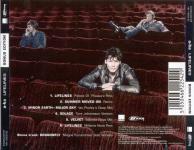 The inside of the insert features a green tone picture of the band sitting in theatre seats with Magne looking through a camera. The a-ha logo is printed in yellow at the top with track information in white underneath. A printed yellow 'sticker' on the front of the sleeve advertises the fact that the single "feat. 4 remixes of Lifelines". Disc 2 has a similar insert (front, back and inside) but is printed in red-tones rather than green. The yellow printed 'sticker' reads "feat. 5 non album versions". 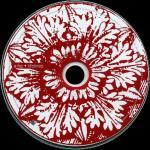 The disc is also similar, but in red tones. Both German singles feature comments on the different tracks by Magne in the inlay. The first 30,000 German CD singles come with a promotion card which allows you to send away for a free fan CD which includes the Apoptygma Berzerk Remix (6:22) of Lifelines - Remix and Additional Production by Apoptygma Berzerk. This CD comes in a card sleeve with a similar cover to the regular release, but printed in grey-tones and "FOR PROMOTIONAL USE ONLY!" is printed on the back sleeve. The disc is also grey toned. Disc 1 features the "Album Version Edit" (3:58) of Lifelines plus four additional remixes: "Boogieman Remix" (4:52), "Console Remix" (4:28), "Palace of Pleasure Remix" (4:44) and "Millenia Nova Remix" (5:41). Disc 2 features the "Album Version Edit" (3:58) of the title track plus the following five non album versions: Solace (Tore Johansson Version) (5:07), Dragonfly (Magne Furuholmen Solo Version) (3:39), Turn The Lights Down (Langer & Winstanley Version) (4:46) (listed incorrectly as "Turn The Light Down" on the reverse of the sleeve), Lifelines (Demo) (5:15) and You Wanted More (Stephen Hague Version) (3:40). The promo single was released to radio stations in Europe in May and to the UK in June(?). The cover is similar to the UK release. The disc is a green grey colour with the title in small letters on the left hand side. Copyright information is printed around the edge of the disc. The only track featured on the promo single is the Radio Edit version of Lifelines (3:59). The German made one track promo single was used as a promo in the UK. It comes with a sticker on the reverse of the case which reads (complete with spelling and grammar errors!) "A-Ha release Lifelines from their 8th studio album on july 8th. The band have had huge suceess with the recently in Europe and look set to do the same here. Rel: July 8th". It also gives contact names and phone numbers for more information. 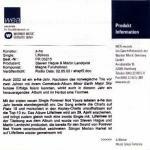 The following information sheet comes with copies of the German 1-track promo (PR 03215) of Lifelines. The front side of the sheet includes information on a-ha (in German), while the back side has a list of the German tour dates. There is a 5" CD-R "Safety Copy" German 1-track promo of "Lifelines". It comes in a jewel case with paper insert. 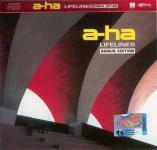 The front of the insert is white with a-ha, "Lifelines" Radio Short Version, wea records logo and Safetycopy - for promotiona use only - printed in black. 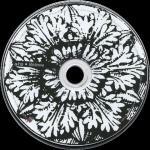 The disc has a white paper label with black titles and wea records logo. Denmark: The German one track promotional CD was also used to promote the single in Denmark. The reverse of the jewel case includes a large "Warner Music Denmark" information sticker with track listed as Fade 03:35 min. Israel: The German red single was used in Israel and comes with a white information sticker on the front and a" Not For Sale" sticker on the back. Norway: There was a two track single available in Norway which features the Album Version of Lifelines (3:58) plus the Magne Furuholmen Solo Version of Dragonfly (3:39). Russia: A Lifelines "Bonus Edition" CD was available in Russia and CIS country (WEA Records Russia & WWW Nikitin records & Europa plus). It comes in a special "Lifelines Bonus Edition" card sleeve, the front and back of which are similar to the front and back insert of the second German 'red' CD single. The single comes in an album style jewelcase with red arches on the front of the insert and old style TV sitting on a chair on the back of the front insert. On the front insert there is also some Russian text plus "Warner Music" printed on a white background on the lower right hand side. Inside the insert is a band shot (Magne, Paul and Morten) with track information in white text on the bottom left hand side. The back insert features the well known shot of the band siting inside a theatre with track information in white at the bottom. The disc itself features the red and white flower emblem which is more of a burgandy red than the German release. 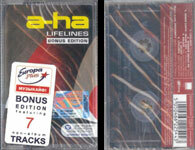 It has the a-ha logo plus "Lifelines" printed in silver at the top of the disc, with "Bonus Edition" printed in red letters on a silver background below. "Warner Music" plus some text in Russian is printed at the bottom of the disc. The tracks on this unique 7-track bonus edition single are as follows: Lifelines (Palace Of Pleasure Remix), Summer Moved On (Remix), Minor Earth Major Sky (Ian Pooley's Deep Mix), Solace (Tore Johansson Version), Velvet (Millenia Nova Mix), Lifelines (Millenia Nova Remix) with Bonus Track - Dragonfly (Magne Furuholmen Solo Version). There is also a Russian 7-track bonus edition cassette single which features the same tracks as the CD single. The cover is similar to the CD single and has a white "Europa Plus" sticker with red and blue text on the front advertising the "Bonus edition featuring 7 non-album tracks". The cassette is transparent with white text. Sweden: The two track single was also available in Sweden - released 2nd September.